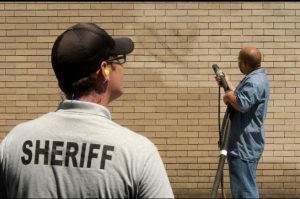 WORCESTER – A work crew from the Worcester County House of Correction used a sandblaster to remove graffiti from businesses in the Canal District on Tuesday morning. The service is offered free by the Worcester County Sheriff’s Office. Sheriff Lewis G. Evangelidis said his office spent $80,000 on its graffiti-removal truck, which is fitted with a power-blasting hose that shoots powdered garnet stone. Officer Dan Joslyn from the Sheriff’s Office accompanied two inmates from the House Correction on the cleanup detail Tuesday. Graffiti was to be removed from The Queen’s Cups at 56 Water St., Lock 50 Restaurant at 50 Water St., Bay State Investment Fund at 1 Kelley Square, SPA Depot Inc. at 73 Green St., and Paper & Provisions at 85 Green St.
Sheriff Evangelidis said graffiti feeds a “broken-window syndrome” as a blight on the community that soon spreads if unattended. Gang tags, meantime, spur trouble as well as being unsightly. Partnering with the city on graffiti removal gives inmates on the work crew useful job skills as well as helping keep the community safe, he said.